Former world number one Tiger Woods has asked for an apology from veteran golf writer Dan Jenkins after being made the subject of a parody interview. Jenkins, who has covered golf for more than 60 years, wrote the spoof for Golf Digest, stating its fictitious nature. He ridiculed the 14-times major winner's failed marriage and joked that the 38-year-old enjoyed firing people and disliked paying tips. Woods described it as a "grudge-fuelled piece of character assassination." Jenkins, 84, who has reported on more than 200 majors, said he wrote the piece because he has never been granted an exclusive interview with Woods, who has not played since August because of injury. 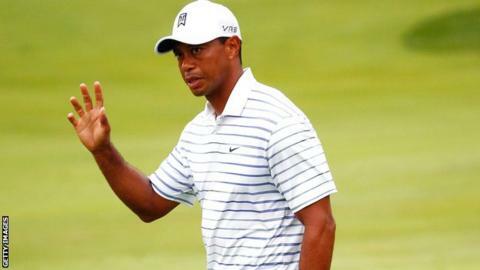 Woods countered: "I like to think I have a good sense of humour, and that I'm more than willing to laugh at myself. "Good-natured satire is one thing, but no fair-minded writer would put someone in the position of having to publicly deny that he mistreats his friends, takes pleasure in firing people and stiffs on tips - and a lot of other slurs, too." Woods' agent Mark Steinberg, who was mentioned in the fake interview, has written to Golf Digest asking for an apology. However, Jenkins wrote on Twitter: "My next column for Tiger: defining parody and satire. I thought I let him off easy". Q: Why haven't you fired Steiny (agent Mark Steinberg), by the way? You've fired everybody else...A: I'll probably get around to it. I like to fire people. It gives me something to do when I'm not shaping my shots. Q: You haven't talked about it, but after all of those New York Post front pages during the scandal, what's the moral of your story?A: That's easy. Don't get caught. Q: You named your yacht Privacy. Because you're a worldwide celebrity, do you really expect and demand privacy?A: I thought about renaming it Serenity, but that pretty much went out the door when the 9-iron hit the window of the Escalade. Q: I don't get it. For a guy who can certainly afford it, you've become famous for being a bad tipper. It's almost like you take pride in it.A: I just don't understand why you're supposed to tip people for doing a job they're already getting paid to do. Q: In many cases tips are expected to be part of their salary...?A: So let 'em go find a better job. Who are sport's highest earners?